Smoky eyes are a glamorous makeup, which has been one of the most fashionable makeups for a few seasons. It creates a refined and mysterious image. Wondering how to get it by yourself? The key to the perfect smoky eyes is to blend colors properly. Avoid blue hues, choose black, gray, brown or dark green shadows and liners instead. 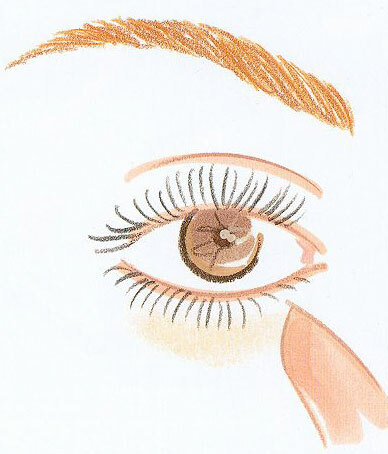 Here are 7 easy steps to create smoky eyes. Below you will find two videos, which will also help you to create it. Start with an eyeshadow base to remove oil from your eyelids and to keep eyeshadow from melting into your eyelid crease. If you’ve chosen a typical black, brown or gray smoky eye, apply a soft eyeliner in one of the colors above the upper lash line. The line should be thicker in the middle of eye. If your choice is jewel-toned eyes, line your eyes with a purple, blue or deep green liner. Use the pencil liner from the inner eye corner to the outer. Smudge both lash lines with a cotton swab or an eyeliner brush. To give your bottom lids the color, which will be the key to smoky eyes, apply the liner of a lighter color to the bottom lids: dot it between your lower lashes. The most important point here is to smudge it. To do it, apply a bit of shadow to get full smudge effect. Sweep light base color over the lids to the browbones. It’s better to use a cream shade of mousse shadow. The shadow should also be shimmery. Thus, you have the eyeliner and the base. Choose a darker eyeshadow shade. Using a brush, blend in color starting at your lash line and then applying it into your crease, blending up and outward. Blend color so that the eye liner disappears. Make sure your eyes match and use a Q-tip, if needed. 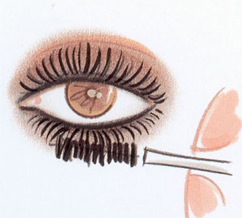 Finish your smoky eyes with some coats of black volumizing mascara you usually apply. That’s it! And here are two videos, which will hopefully be helpful to you in creating smoky eyes. The way these makeup artists create smoky eyes may differ a bit from that described above, these all are methods of doing it. So, feel free to choose the one you like most. Good luck! That’s so useful! Thanks a looot! I must try it… or at least i’ll ask my sister to help me. That are very cool photos and tips. I want smoky eyes! Thanks, Albey! I really hope, these tips will be helpful in creating real smoky eyes. You should give credit where credit is due. These photos are from a book by Kevyn Aucoin who was a fabulous MUA that has passed. I think the article is helpful, but as a loyal fan, I was angered to see his material was being used without credit. these instructions are amazing. I was able to do it while reading. Aren’t those pictures from a book that’s been on the market for years????? First you use the pencil for the inner eyelid, not a liquid eyeliner, and then the same eyeshadow under to the outer lower eyelid to get the smoky eyes effect. Thanx alot for ur response…but wat i wanted to ask was that in casual makeup when we going to university etc, we don’t use eyeshadows but wat should we apply on the lower eyelid for a jet black look?should we use kohl eye pencil or liquid eyeliner? (when we don’t want to use eyeshadoe)..wat would give a darker effect kohl pencil or liquid eyeliner?which of these should i buy? I love it! This is a great write up and the examples/drawings are very helpful for me. I’ve lately become obsessed with the Smokey Eye look ever since I watched Kim Kardashian’s video on YouTube, lol. Have you seen Smokey Eye Tutorial? I came across that site as well in my searches… you should definitely submit your article there! This is a great step by step tutorial! It sounds simple and easy! I’ve always had trouble creating this look on my peepers. IDK, it makes me look like I had a black eye or something. LOL… but I will definitely try this on my peepers.